Kedarnath Mandir is one of the holiest Hindu temples dedicated to Lord Shiva, located atop the Garhwal Himalayan range near the Mandakini river in Kedarnath,Uttarakhand in India. Due to extreme weather conditions, the temple is open only between the end of April to Kartik Purnima (the autumn full moon). During the winters, the murtis (idols) from Kedarnath temple are brought to Ukhimath and worshipped there for six months. 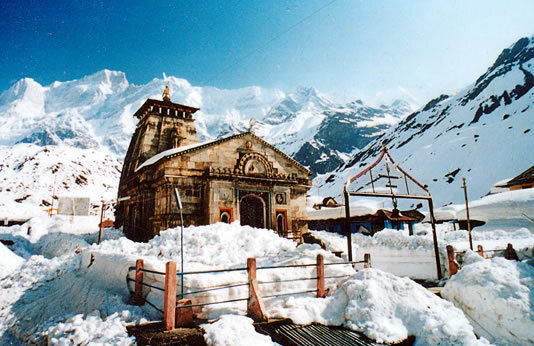 In this region Lord Shiva is worshipped as Kedarnath, the 'Lord of Kedar Khand', the historical name of the region. This temple is a Paadal Petra Sthalam (the 275 Holy Abodes of Shiva on the continent), praised by the Tamil Nayanars saints in the 6th-9th century CE. The temple is not directly accessible by road and has to be reached by a 14 km uphill trek from Gaurikund . The temple is believed to have been built by Adi Sankaracharya  and is one of the twelve Jyotirlingas, the holiest shrines of Shiva. The older temple existed from the times of Mahabharata, when the Pandavas are supposed to have pleased Shiva by doing penance in Kedarnath. The temple is also one of the four major sites in India's Chota Char Dham pilgrimage of Northern Himalayas. Chardham Yatra comprises of a pilgrimage to four shrines in Uttarakhand Himalayas -- Badrinath, Kedarnath, Gangotri and Yamunotri. Himalayas reopen for pilgrims in April-May every year after remaining closed for nearly six months during winters as the area remain snow-bound during the period. Two other shrines of Gangotri and Yamunotri will reopen on Akshya Tritiya (April 24). While Badrinath is situated at a height of 3133 meters in Chamoli district, Kedarnath is situated in Rudraprayag district at a height of 3584 meter. Gangotri and Yamunotri shrines are situated at a height of 3200 meter and 3615 meter respectively in Uttarkashi district. The annual Chardham yatra, the most important event for tourism in the state, attracts nearly 15-16 lakh pilgrims every year, both from India and outside.